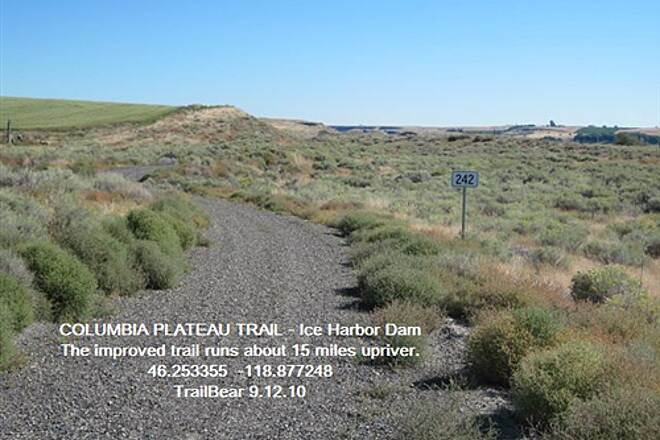 As of late 2011 the Columbia Plateau Trail State Park has developed 38 miles in two segments between Fish Lake near Cheney and Martin Road near Sprague, and between Ice Harbor Dam near the Tri-Cities and Snake River Junction. 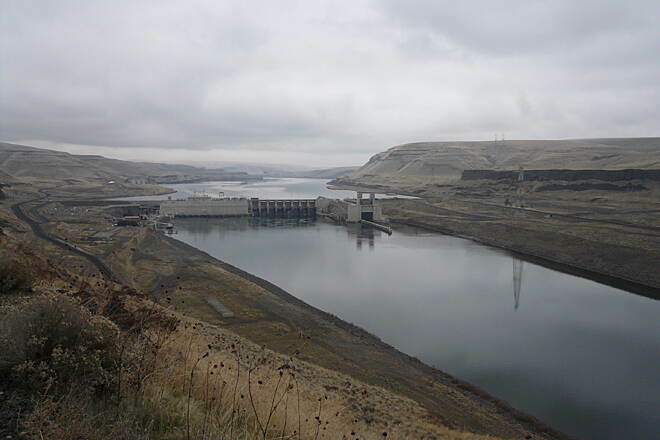 It passes through the scenic uplands of eastern Washington and along the Snake River. The middle 92 miles are undeveloped and difficult going. 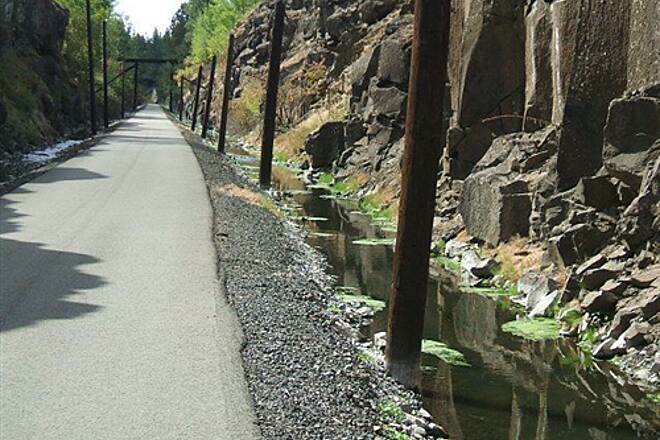 The trail follows part of the former right-of-way of the Spokane, Portland and Seattle Railroad, and you'll see mile markers with numbers referencing the distance from Portland, Oregon. 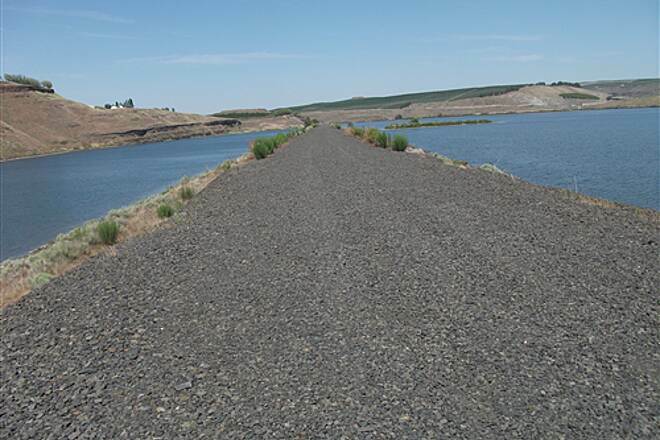 The 23-mile northern segment (Fish Lake to Martin Road) is paved for the first 3.75 miles, from Fish Lake to Cheney, with parking and bathrooms at both locations. 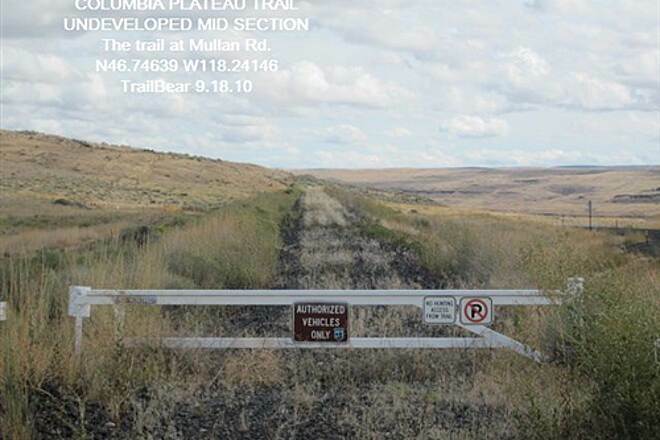 The trail then turns to gravel and passes through Turnbull National Wildlife Refuge on its way to the Amber Lake and Martin Road trailheads. 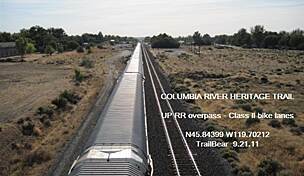 The 15-mile southern segment runs between Ice Harbor Dam and Snake River Junction. 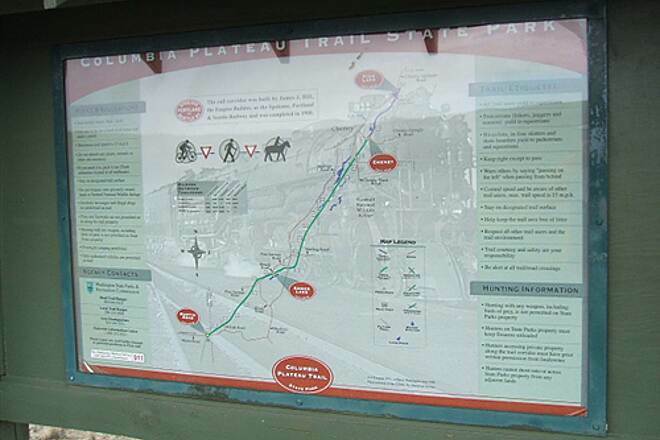 You'll likely see much wildlife among the scenic landscape, and interpretive signs tell about key features along the trail. 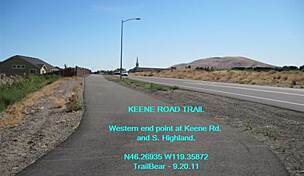 The trail connects to the unpaved Fish Lake Trail on the north, which will eventually reach Spokane. 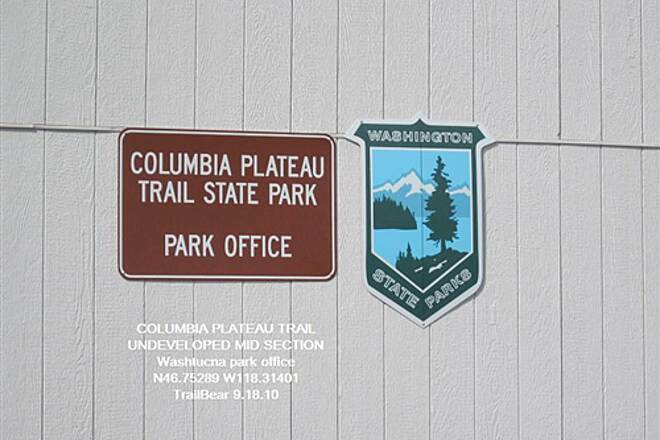 For more information, call Columbia Plateau Trail State Park at 509-646-9218. An access fee is required. 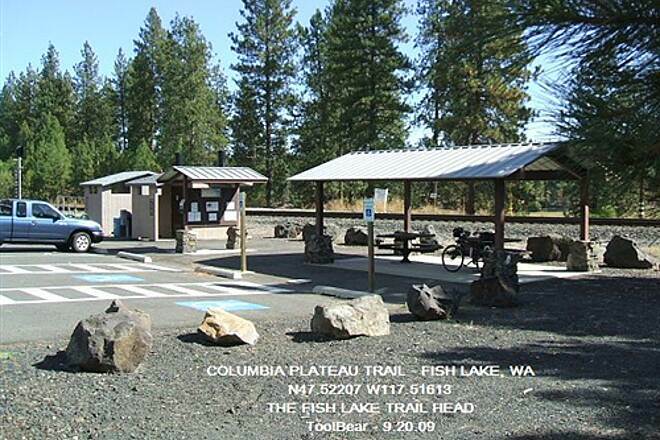 Fish Lake Trailhead (milepost 365) with parking, a picnic shelter and tables, restrooms and an informational kiosk. 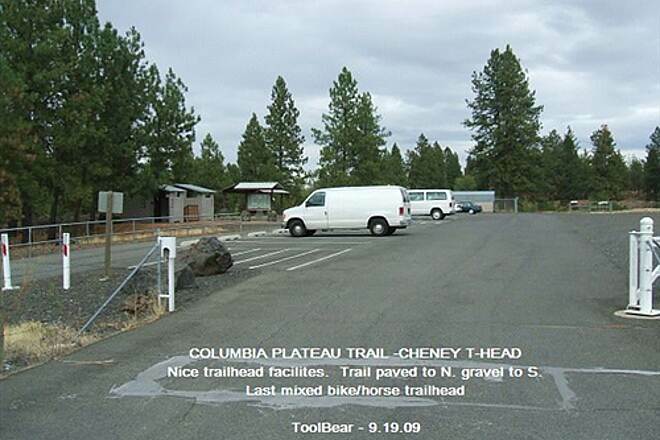 Cheney Trailhead (milepost 361.25) with parking (including equestrian units), restroom, picnic shelters and tables, and an informational kiosk. 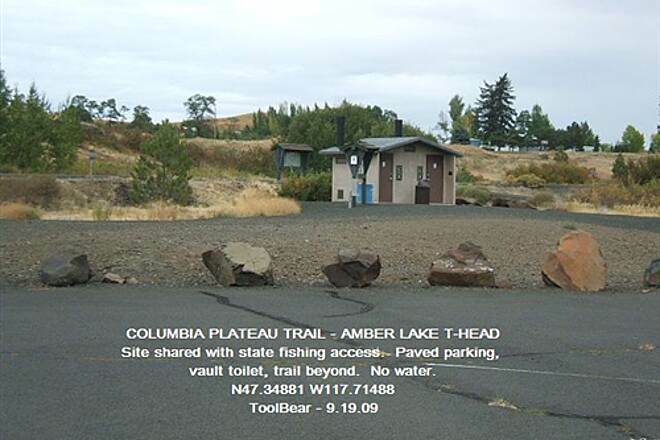 Amber Lake Trailhead (milepost 349.25) with parking (including equestrian units), equestrian highline, restrooms and an informational kiosk. 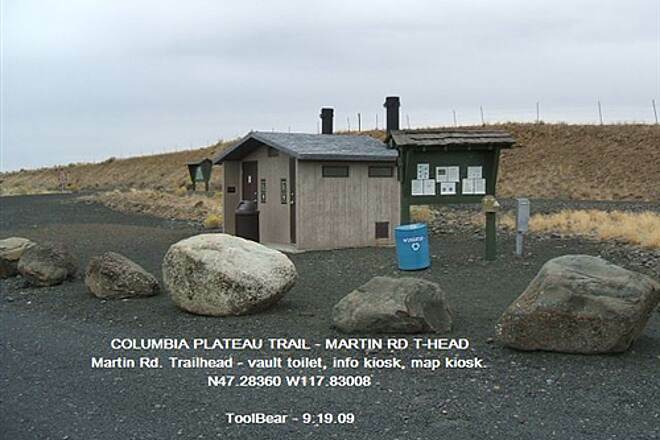 Martin Road Trailhead (milepost 342) with parking (including equestrian units), equestrian highline, restrooms and an informational kiosk. I am looking forward to the day when all 130 miles of this trail is open, but for now the most southern 15 miles is “Open” and will have to do. 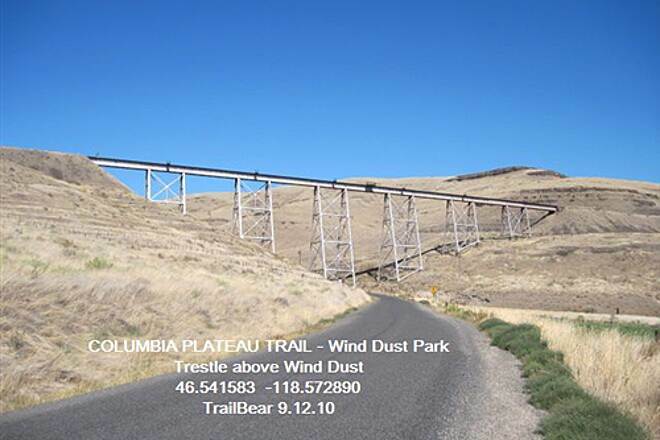 It was a beautiful October day, so I decided to go for a ride, the trail can get quite hot in the Tri-Cities summers, and the park is available for use year round. The concept of open is interesting and was explained to me this way, the section which is not open you can go on but it offers no facilities (92 miles). 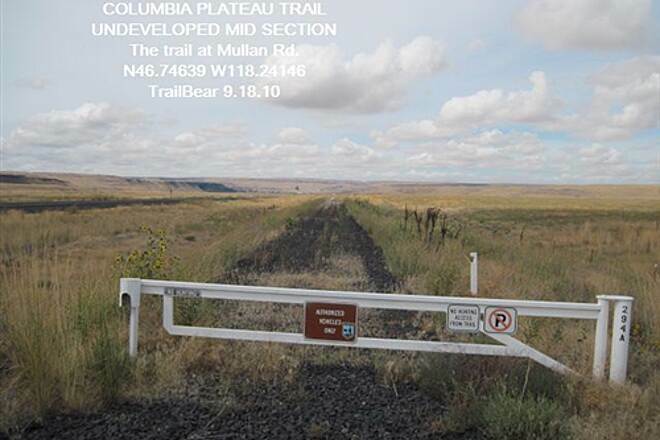 The section not open contains gated Trestles creating difficulty in passage of the trail. I have rode this 15 mile section twice and both times it has taken me 2:40 to travel one way and 3:00 to travel back. 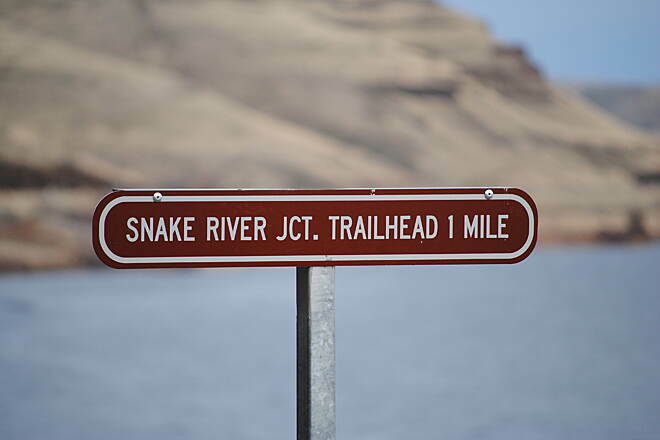 I find this funny because you are traveling upstream toward Snake River Jct. so you would think the return trip would go faster, it just doesn’t seem to. 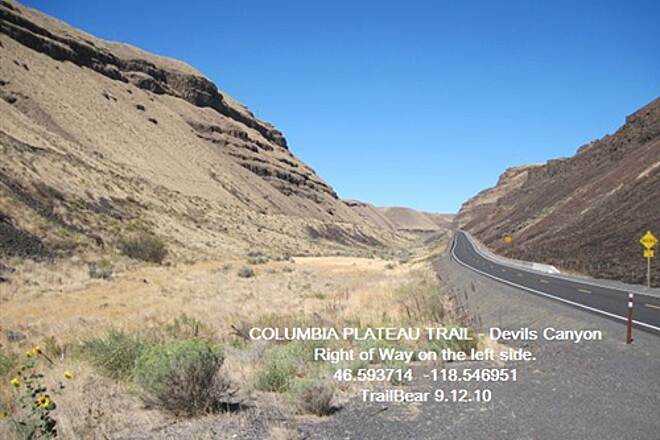 The surface of the trail is the largest drawback, again my mind dreams of a time when the trail has a paved surface. 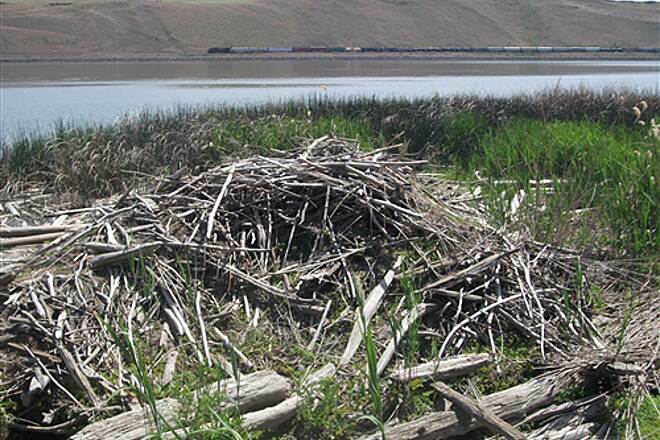 However this is not in the development plans for the State Park. From Ice Harbor the surface is almost acceptable and continues to deteriorate the farther up the trail one rides. 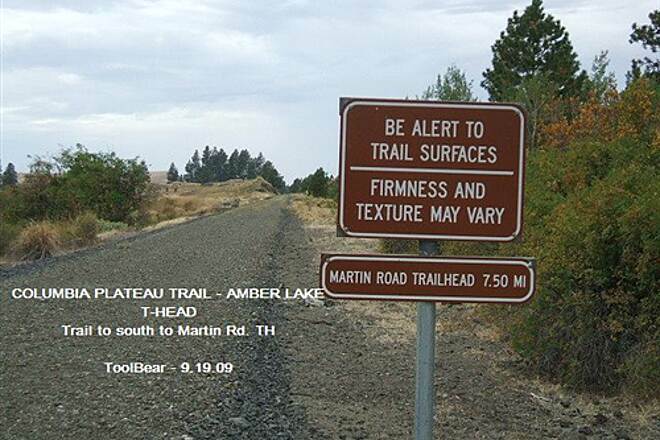 By the time you reach Big Flat (Dalton Lake) the trail is rough, but finer gravel has been placed on the trail over the entire 15 miles. 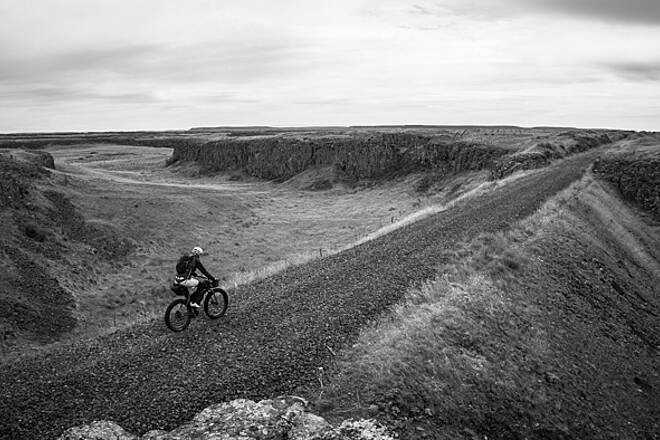 The surface of the 92 miles which are not open are extremely rough, there are no fine gravel and it has not been smoothed out or compacted if you ride these sections you will appreciate the work done on the southern 15. In summary the surface could use improvement but I rode it on my Mt. bike which has no suspension. 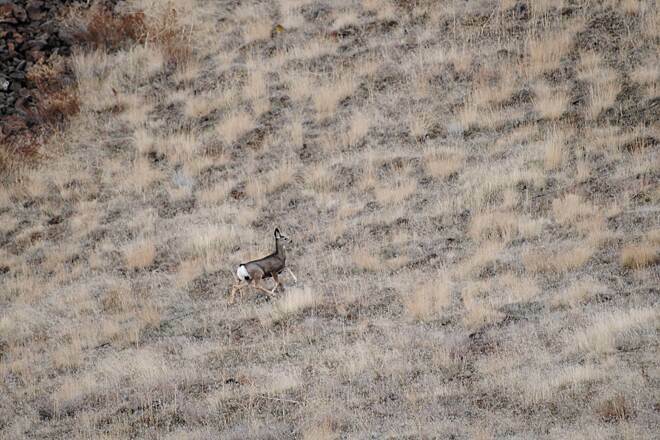 The encounters I have had on the trail are very limited with Human Beings, and relatively frequent with wildlife, which on 10-04 included, Blue Herron, Canadian Geese, and many other birds, White tail deer, Snake, and fish jumping. 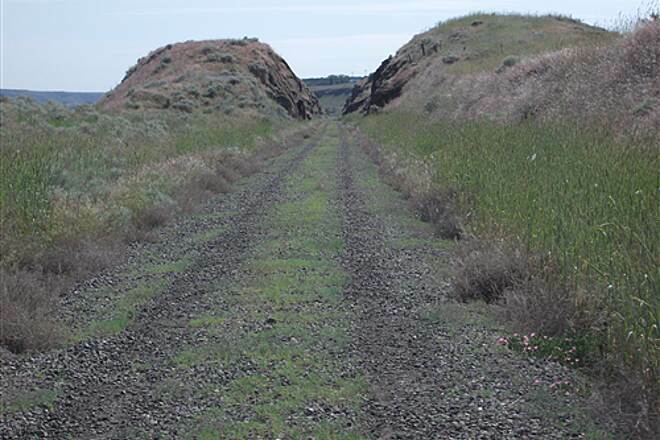 We've hiked some of the graveled section from Cheney-Spangle Road south and have ridden our bikes from Fish Lake to Cheney-Spangle. The latter section was exceptionally scenic and GORGEOUS! 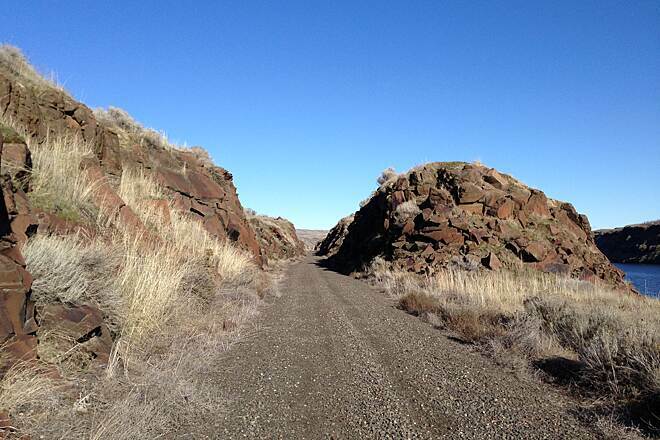 The basalt rocks, the vegetation, and the little streams running on either side of the trail, along with a quiet evening, made our ride very peaceful. We even saw a porcupine along the way and heard it communicating with it's babies/baby in a little rock cave. 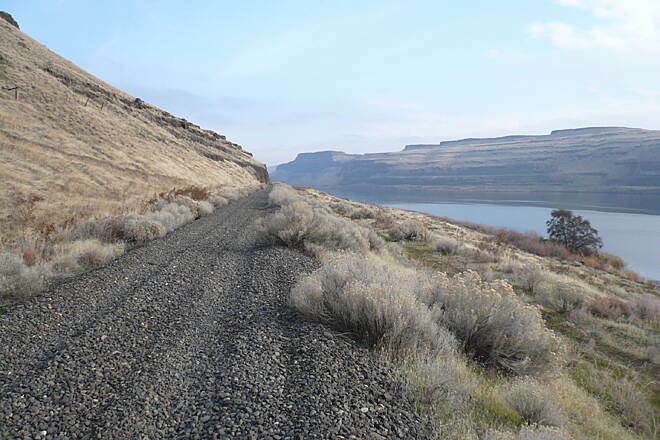 I love the Channeled Scablands. Maybe it's because I took geography classes at EWU. It's a fascinating and a beautiful area once you learn about it. Also, my dad worked for the SP&S. Two of my friends and I set out from Sacajawea State Park in Pasco up the road to the CPT, planning to hike to the town of Kahlotus in 3-4 days. Unable to find much info on the trail beforehand, we had no idea what to expect as far as the backpacker's experience. 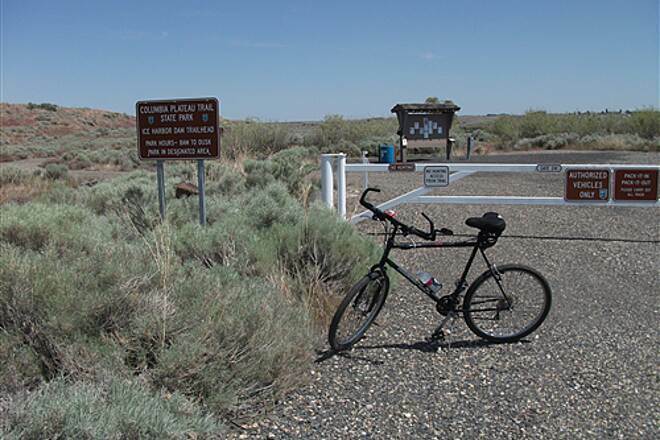 The trail, sites, and parks along the trail do not allow camping, except for a very few. The one park that did offer camping, Windust Park, was closed when we got there. 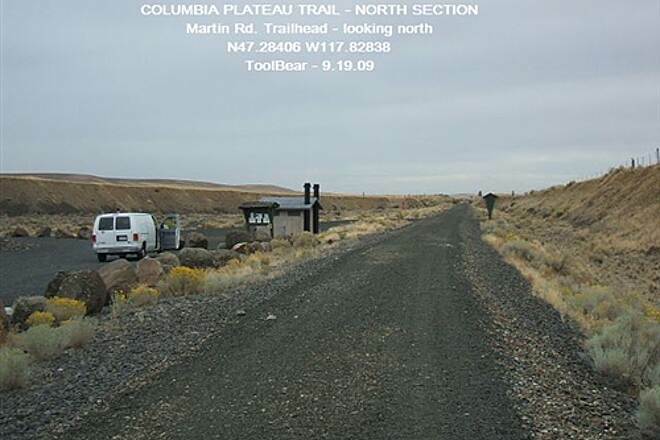 Because many parts of the trail are so remote, I suppose one could camp in the places furthest from the roads and not get caught, but we chose not to, and ended up having a friend pick us up each day and shuttle us back to Pasco- the closest site with services. 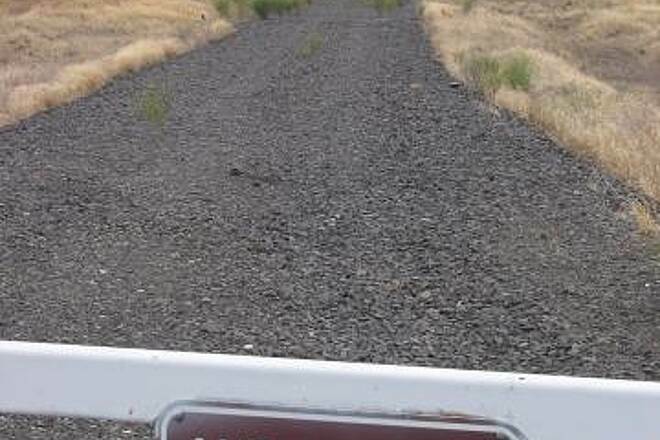 I am somewhat appalled that camping is not permitted along this trail. 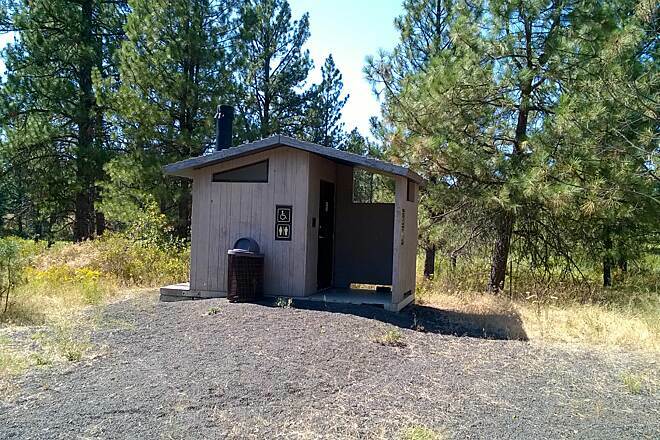 The trail itself is steady and flat, and has several port-a-potties along the route at the different junctions with roads and the wildlife habitat areas (no camping!). 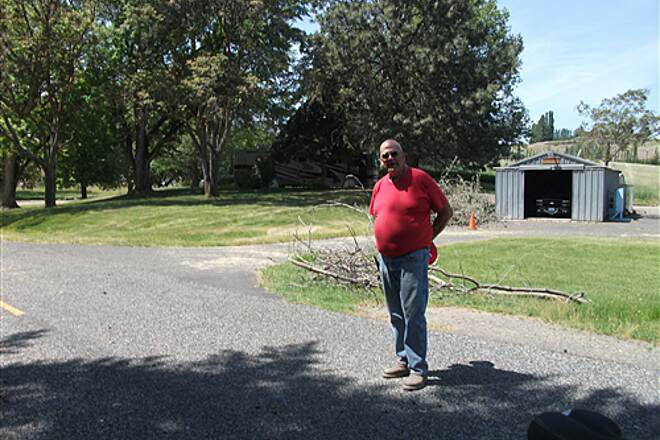 The towns of Kahlotus and Washtucna have very little to offer in terms of stores, even for buying water, so plan on treating the creek or river water, which seems sketchy-most of the creeks are farm runoff. 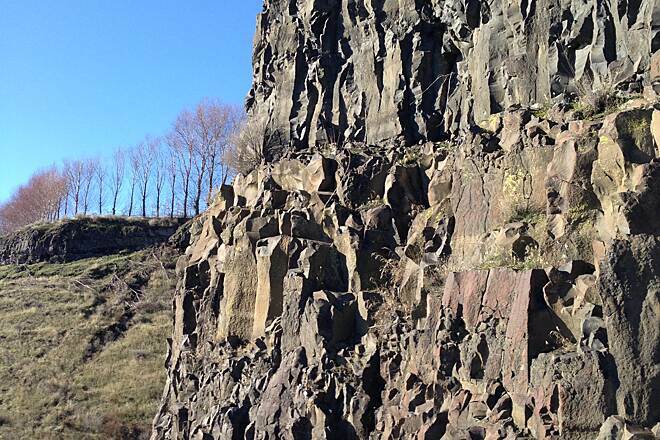 I can't imagine hiking this trail, or that it was intended whatsoever for hikers. 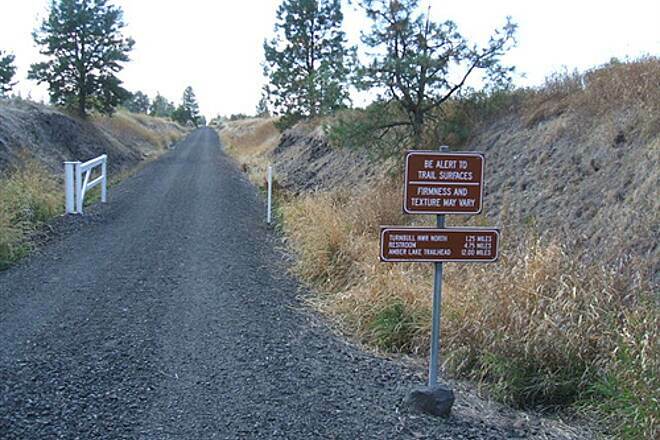 I think it may be fun to go biking, if you enjoy riding a mountain bike down a flat gravel road. Some of the views along this route are great. We did encounter several rattle snakes- not just hearing the rattles, but having them come across our path, or coil up in a strike position. 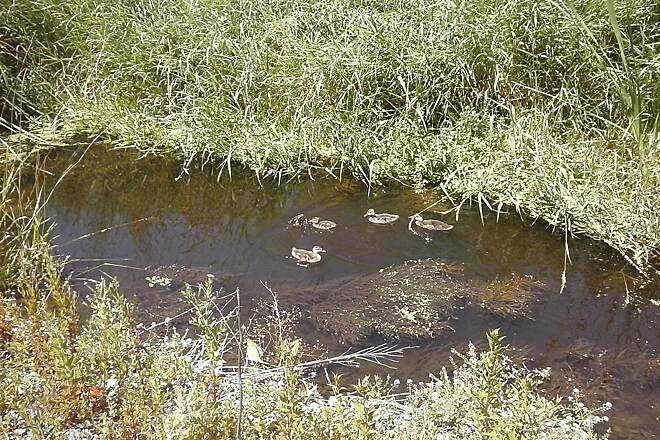 I am not exaggerating- we saw at least five rattlers in four days. 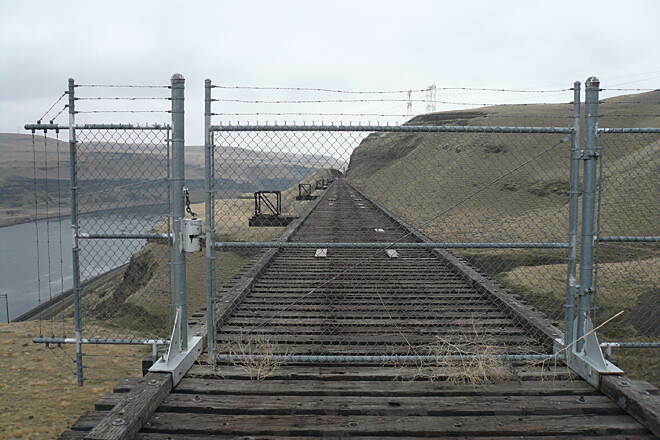 Finally, if you plan to hike this trail, keep in mind that all of the old train bridges have been very effectively fenced off by the Army Corps of engineers, so you cannot cross them. 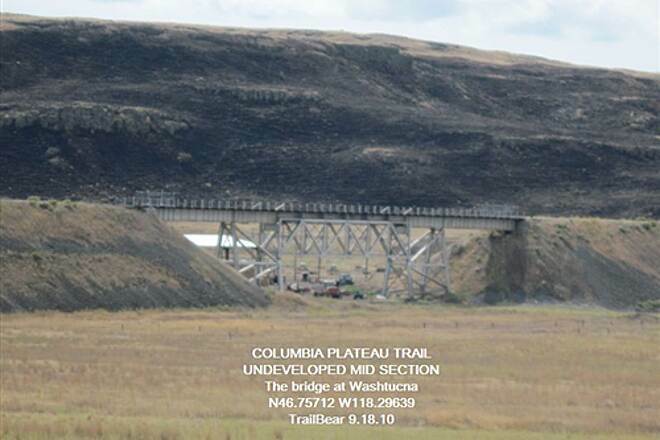 Obviously, this is a great way to keep drunken teenagers from playing on them, but if you are hiking down the trail expect MAJOR delays if you encounter a bridge, because most of the time you will need to double back to less steep terrain, find an alternate route, and then find another way back up to the trail after the bridge. 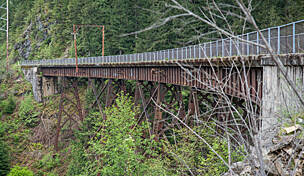 It would be better to plan an alternate route around each bridge beforehand. 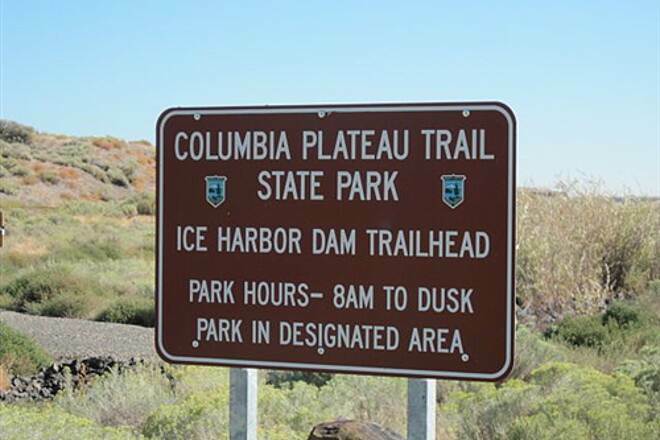 Columbia Plateau State Park - Ice Harbor Dam to Snake River Jct. 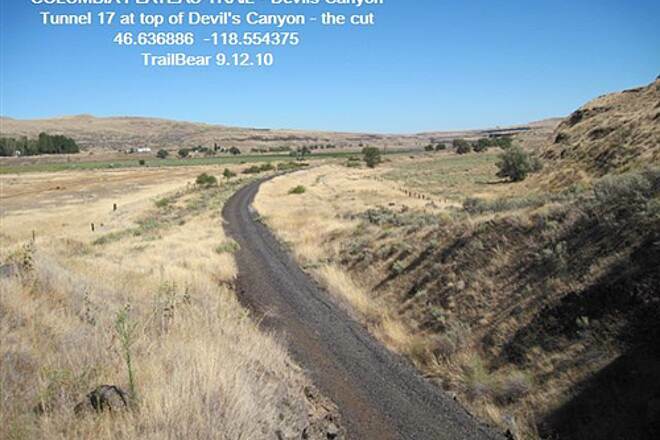 I give the trail surface a 1 and a half stars and the scenery 4 stars. I will probably never ride this trail again and I live 20 minutes from here. 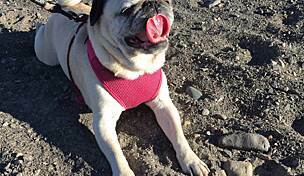 There is no potable water available on this trail. If you got desperate I'm sure a few drinks from the river wouldn't hurt you. 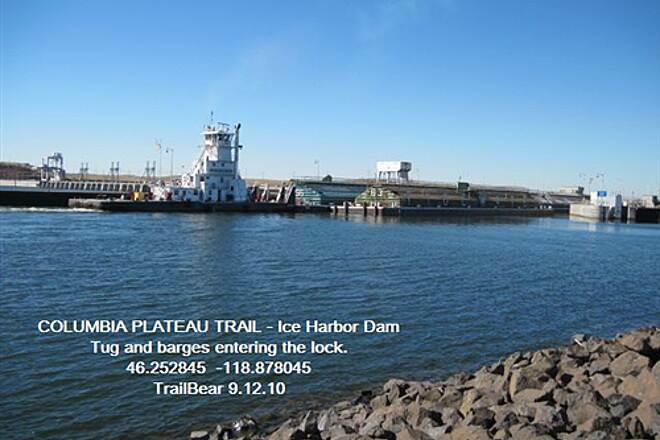 I started the ride at the Ice Harbor Dam Trailhead. Clean restroom. No water. Lots of free parking. Nice boatlaunch facility with nobody using it on this GORGEOUS Saturday in May. From here the trail consists of mostly 3/8" crushed rock with medium ballast underneath that's not compacted but my trailbike handled it OK. (I averaged 10 mph until I got to Big Flats which was about 6 miles into the ride.) I didn't see another bike all day and except for a few fishermen, I felt like Lewis and Clark on their expedition. 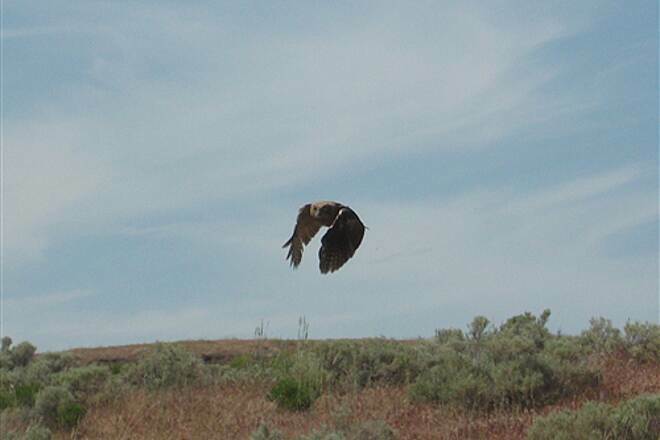 I saw several blue heron, many loons, some HUGE owls with a nest right next to the trail, geese, a school of late run Chinook salmon, hawks, a huge cliff with swallows nesting, signs of badger, a very cool beaver hut, and lots and lots of amazing scenes of the Snake River. All the parks were closed. The only activity allowed was in Levey Park boat launch on weekends only. 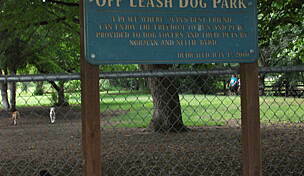 Joe, the custodian at Levey, told me this was the first year he could ever remember the parks being closed. Levey is/was a GORGEOUS Park with an amazing beach. Such a waste. 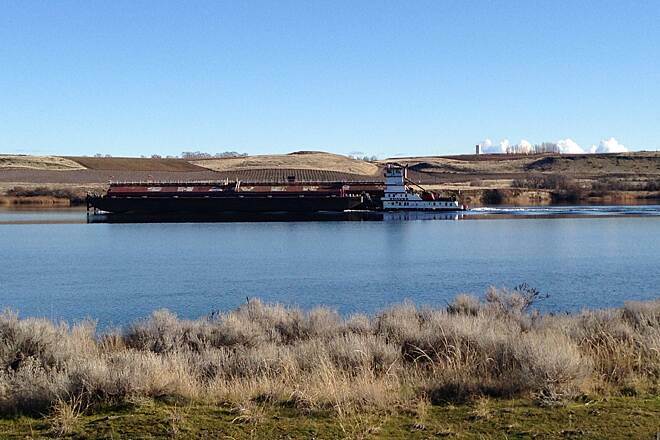 Big Flats had lots of bank fishing happening in the lake created by a land bridge across an inlet in the lake/river. 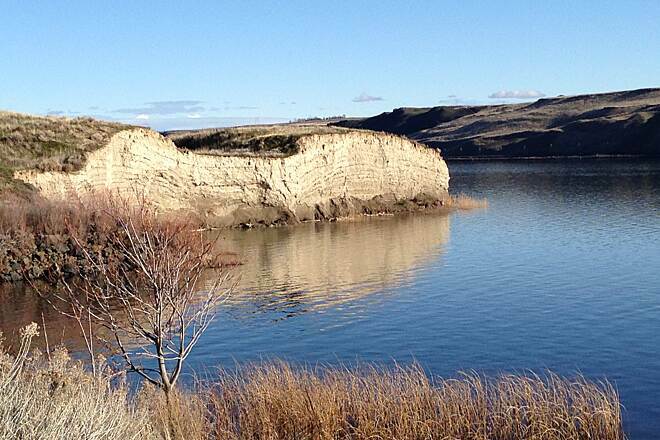 It's called Sacajawea Lake above Ice Harbor Dam. 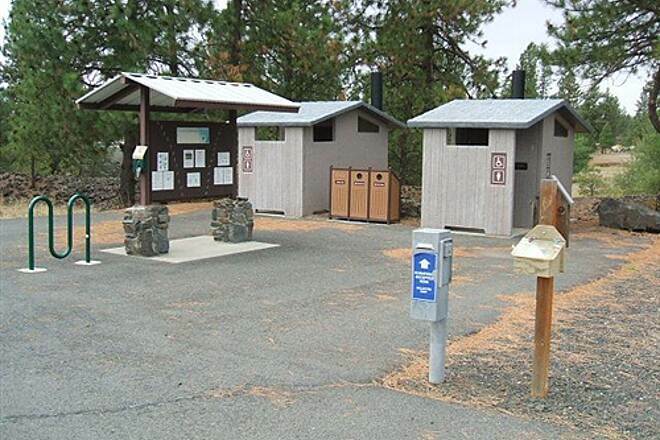 Nice open restrooms and again no water. 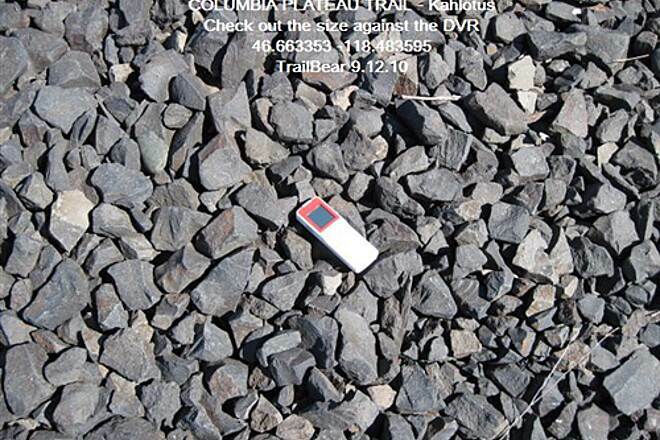 From here the trail surface had no crushed rock...just medium sized ballast uncompacted. The going was MUCH slower! Only averaged 6 mph from here to Snake River Jct. 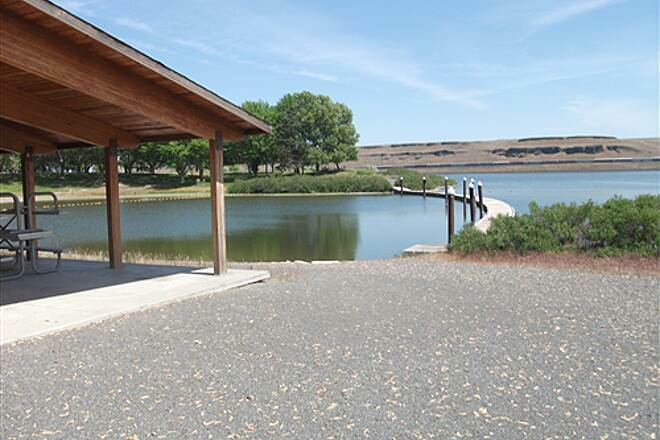 Clean restrooms and covered picnic area. 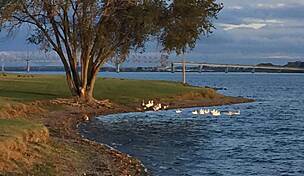 It looked like the garbage can was missing and birds had scattered garbage folks had stacked near the recycle can. Because of the difficulty riding the trail I decided to take paved roads back. It was 4 miles further but not nearly the effort. 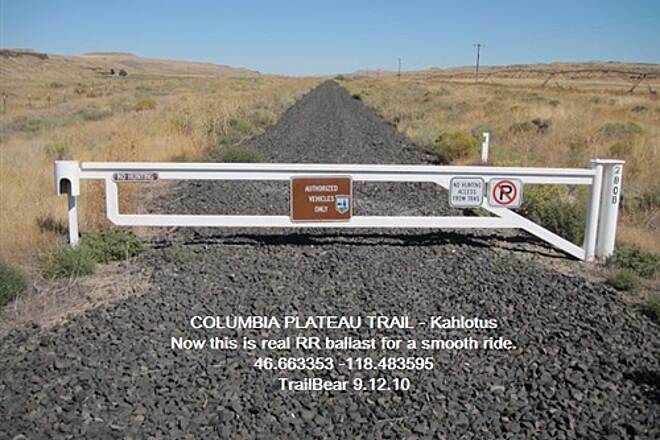 The Columbia Plateau Trail – a Washington state park – comes in two sections with a long stretch of undeveloped trail in the middle. 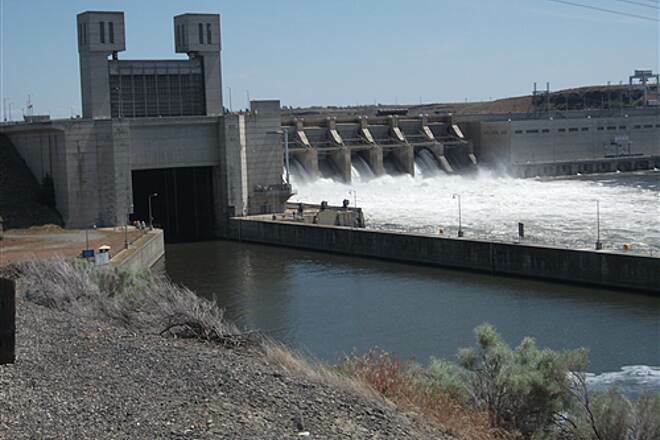 There is a fifteen mile stretch along the Snake River on the south end and a twenty three mile stretch below Spokane on the north end. 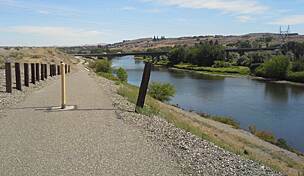 I checked out all the northern section trail heads and rode the paved portion on my way to the Trail of the Coeur d’Alenes. You can overfly it in Google Earth. 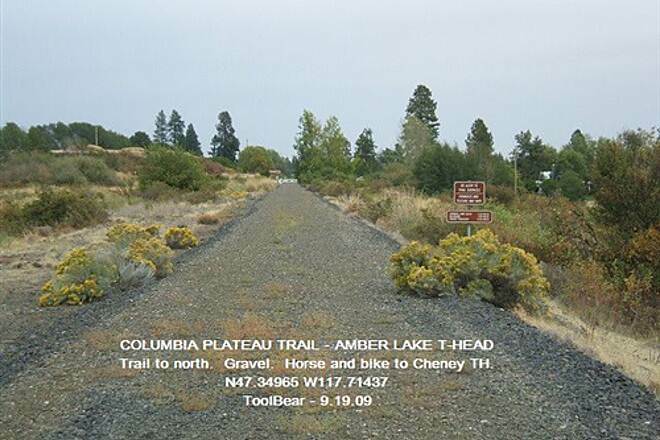 Find Fish Lake and follow the rail bed that goes past Amber Lake. The other bed is still active. 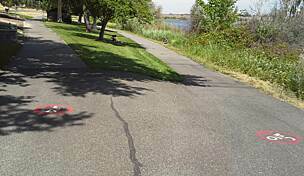 The northern section has four trail heads (Fish Lake, Cheney, Amber Lake, Martin Rd. ), one water point, and two types of surface. 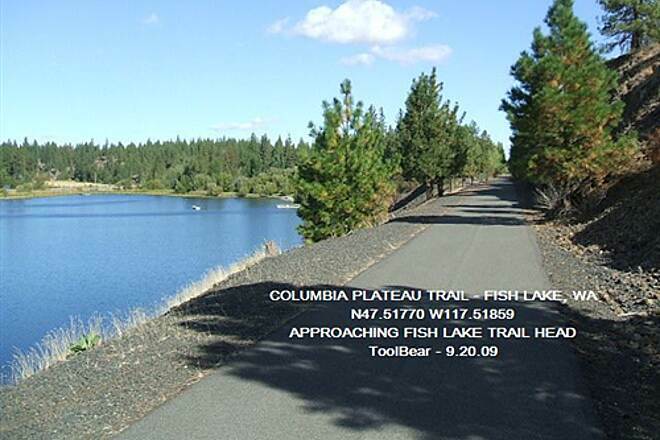 From the northern trail head/trail end at Fish Lake, the trail is blacktopped down to the next trail head at Cheney (3.75 miles). 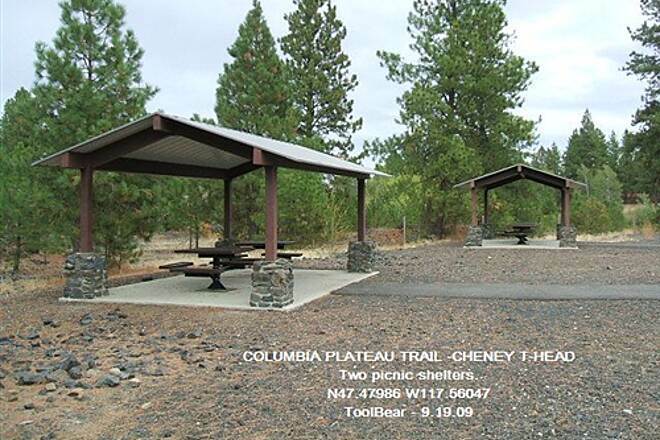 The only water on the trail is at a water point about 0.25 miles N. of Cheney, but it has a bench and overhead shelter. Take a water break. 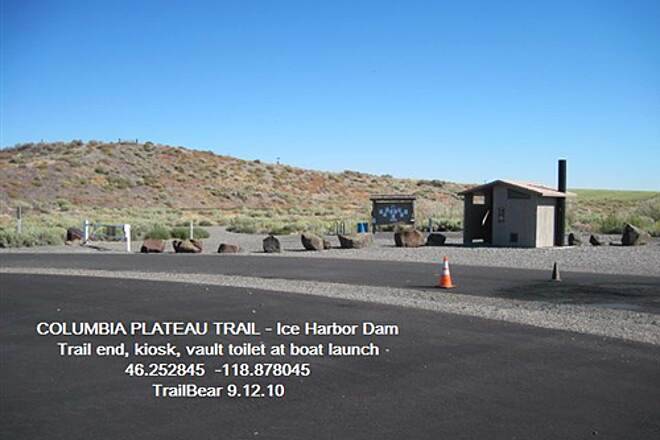 The paved portion has a 5 star surface, 5 star scenery and 4 for facilities (flush toilets and water gets you a 5). Way too short, but a great ride. 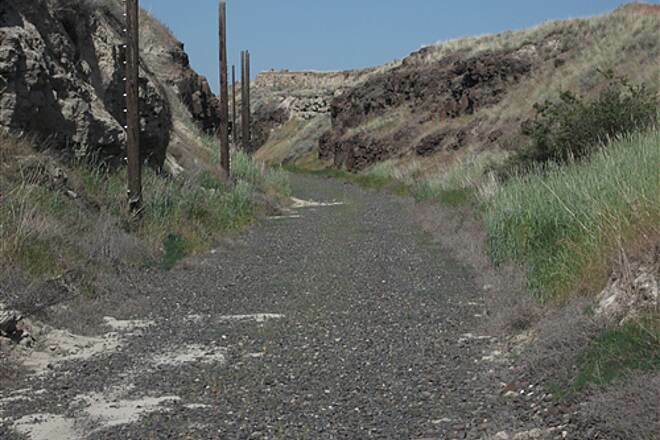 A portion of the trail runs through a long cutting in the basalt. Springs gushing out of the wall turn the ditches on both sides of the trail into rushing brooks which drain down to Fish Lake. 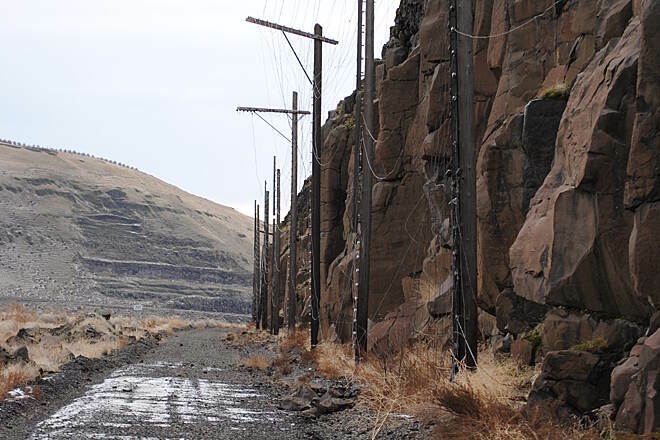 The old poles and insulators for the rock fall alarms are still there – with some new boulders that have fallen off the walls. 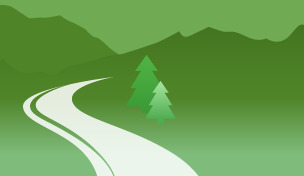 Rocks, meadows, pines, lakes – it’s a delightful ride. From Cheney south to Martin Rd. 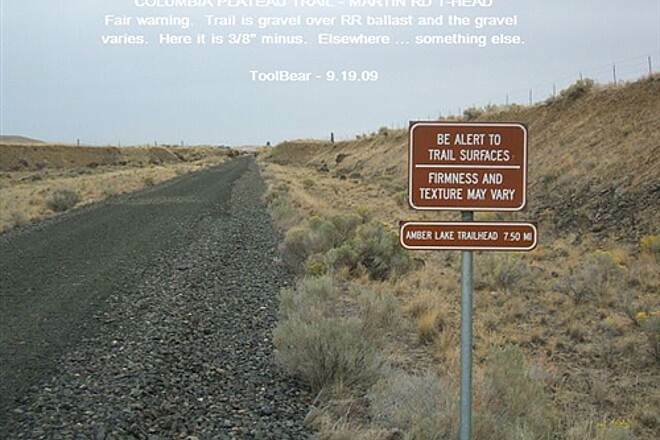 the trail is set up for horses, hikers and bikers so the surface is gravel - in fact, a variety of gravels. Their signs warn of varying surfaces. I saw ¾” minus and 3/8” minus at Martin Rd., 3/8” mixed with a bit of drain rock at Amber and 3/8s at Cheney. The surface is not hardpacked. The upper inch is a bit loose. Road bikes might not like this. My mountain bike did OK. You can ride it and report back. 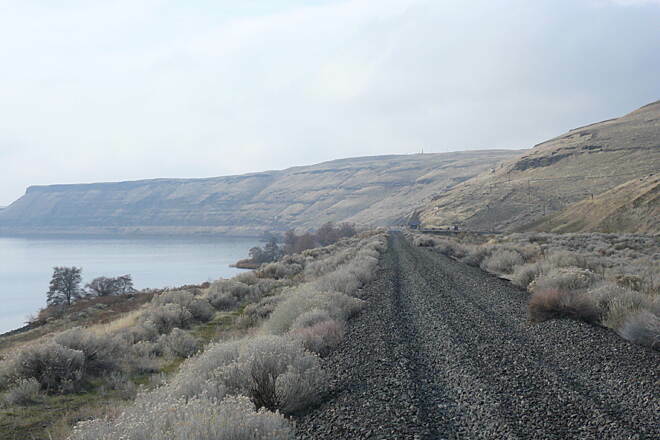 The section from Cheney to Amber Lake runs through the Turnbull National Wildlife Refuge. Might be interesting. 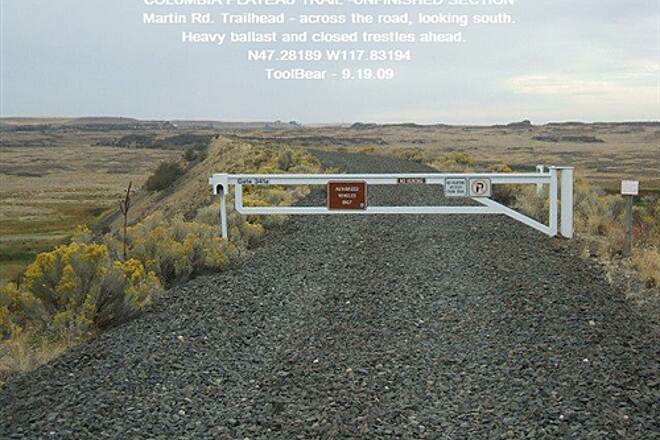 Below Martin Road down to the Snake River, the trail is unimproved and gated shut. It’s rough ballast and closed trestles and the Back of the Beyond. A chap did it with a touring bike with 4” tires and we admire his efforts. However, a five star blacktop surface does appeal more. The CPT North is a nicely done project. 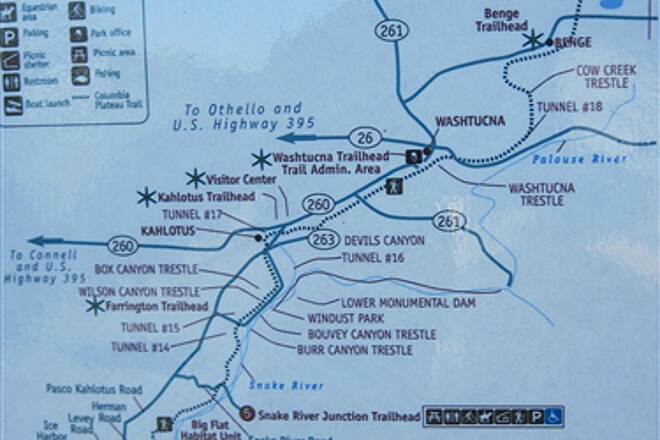 It has good trail heads and facilities. One very nice feature – which is so rare – is their highway signage. Excellent. Never seen better. They picked me up on I-90 west of Sprague, got me off the freeway, through Sprague (a descending loop) and off on the right county road to Martin Road TH. Then they worked me up the various back woods roads to Amber, then to Cheney and up to Fish Lake. Where ever I needed a directional sign, they had one. While I travel with two GPS units and a suite of topo maps and can sort it out, the average traveler can appreciate their excellent signage. 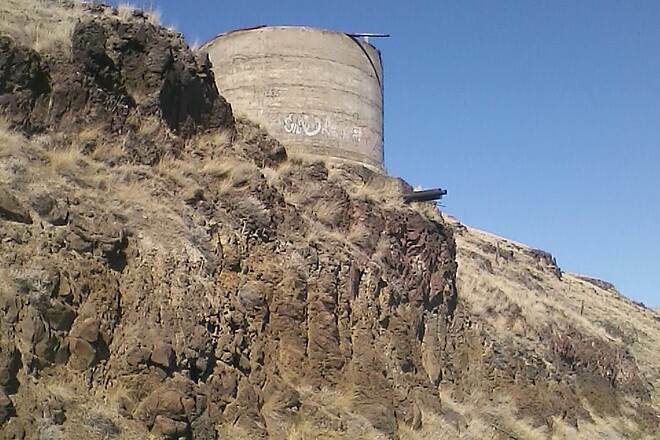 Cheney is a pleasant community and home to Eastern Washington U. We found that Zip’s Drive In on the main drag had excellent fast food at reasonable prices. It is sooo Not McDonalds. The food had flavor and was cooked to order. 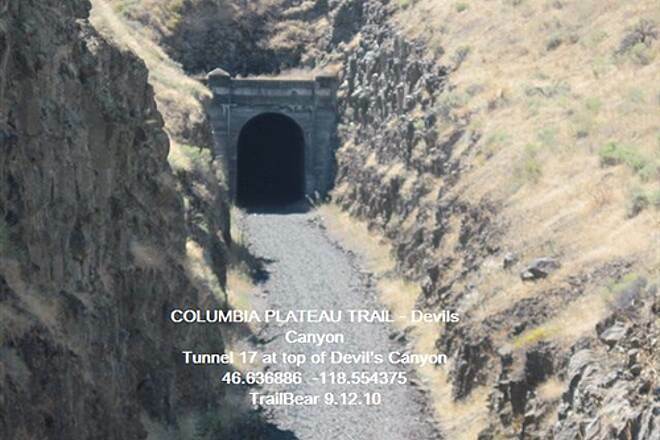 "In mid July we bicycled about 15 miles of this trail. 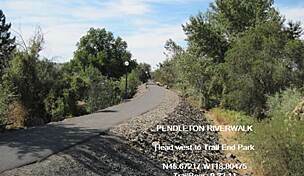 The three to four mile portion north of the Cheney trail head is paved and is quite enjoyable. 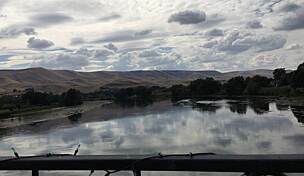 However, if you enjoy wildlife (particularly song birds and water fowl) the really sensational stretch is the seven or eight mile segment that runs south of the Cheney trail head and through the Turnbull National Wildlife Refuge. "